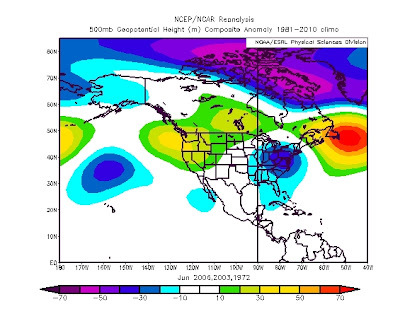 June's record setting rainfall in much of the Mid Atlantic has been brought to us largely due to the same forces that yielded the unusually cool and wet Spring in the Great Lakes and Midwest (remember the snow that fell in Minnesota at the beginning of May?). Yep, a high amplitude blocking pattern has produced the pattern that we've been paddling through for the last several days. You can see the pattern outlined below. The solid bright green line marks a rough boundary of the jet stream through the country. A Bermuda High is positioned off of the East Coast, with a strong ridge of high pressure over Nevada. The result of the western high was record heat in a slew of states and provinces, with highs reaching 90 degrees as far north as Edmonton on Tuesday (and heat index values around 100 thanks to dew points in the mid 70's). In between the Bermuda High and the western ridge, a cut off low was centered and bringing record lows to Texas and Oklahoma. It was in the low 50's in Oklahoma yesterday morning and record lows were set into Texas as well (Waco's record of 64 was knocked off by five degrees yesterday!). 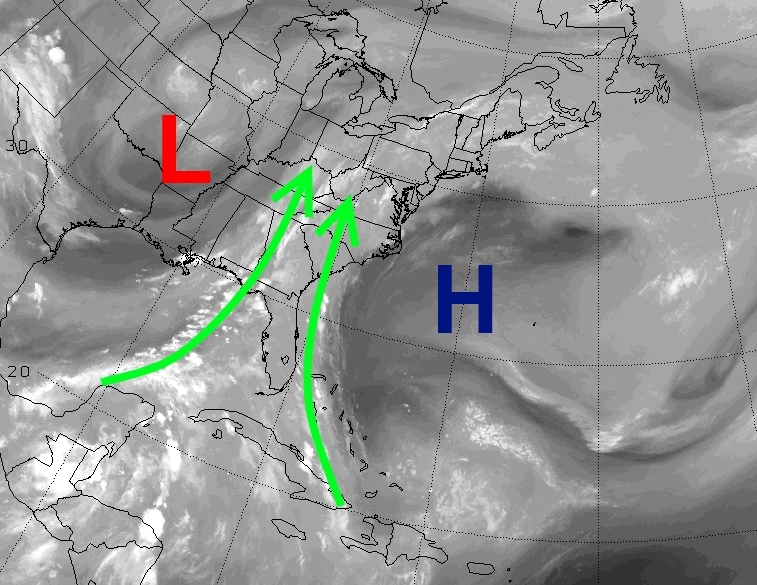 This cut off low was responsible in large extent for the shower and storm activity last Sunday as it approached us but it has since retrograded towards the Ohio Valley and Mississippi Valley. This retrograde has been in response to a shift in the Bermuda High's size -- from a more amplified north-south orientation to a bit broader, flatter look. 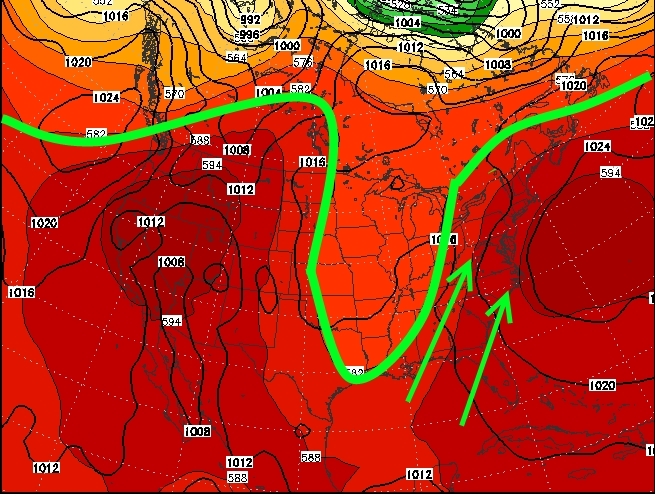 The high has also nudged west a bit and as a result has pushed the upper low west as well. The result of this has been a gradual shift in the plume of moisture as the Bermuda High's return flow (clockwise pattern brings moisture up to the west of the high) and the upper low's draw of moisture (it pulls moisture north to the low's east thanks to its counter-clockwise flow) results in the moisture channel nudging into the South and Ohio Valley, less so over us. While the heat that builds thanks to the Bermuda High will still support some scattered thunderstorm development each afternoon, it will be more typical of summertime heat and humidity combinations and not a pattern that will require assemblies of arks and other boating means of transport. The thunder threat over the next few afternoons is more "pop up" in nature and induced by heat, humidity, and atmospheric instability. Summer months that feature such excessive rainfall -- June 2006, 2003, and 1972 to name three -- all feature some level of stronger upper level trough in the Ohio Valley with a stronger upper ridge in the Western Atlantic, sufficient enough to make it rain over us. June 2013 will fit this bill we went through two separate episodes of this -- one during the first week of the month (in concert with Tropical Storm Andrea's remnant moisture) and the second at the very end.